Firm created extra 300 jobs under outgoing MP – successor Shaun Murphy hopes to build on that success. 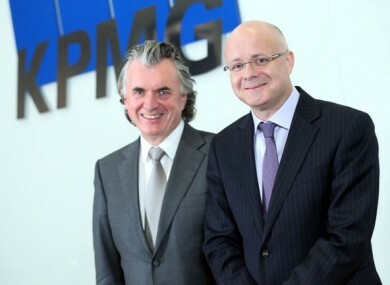 AUDIT, TAX AND advisory service providers KPMG have just announced a new Managing Partner. Shaun Murphy is to take up the role in May next year, taking over from current Managing Partner Terence O’Rourke. O’Rourke oversaw an increase in revenues of over 16 per cent in his six years in the role. The number of employees in the firm also increased from 1,600 to 1,900 in that term. O’Rourke said that his successor had the “experience, expertise and the personal qualities to successfully lead the outstanding professionals in KPMG”. Murphy became a partner at KPMG in 1999 and has specialised in the Irish headquartered plc, Consumer & Industrial and the privately-owned Irish Business sectors as well as developing KPMG’s tax practice. KPMG produces a useful analysis document each Budget Day, which breaks down the implications of tax changes for everyone from individuals and households to businesses. This was their Taxing Times for Budget 2012 – keep an eye out here for the Taxing Times breakdown following Budget 2013 on Wednesday/Thursday this week. Terence has very successfully led KPMG through a period of huge change for the Irish economy whilst strengthening our market position. The skills and commitment of our people are fundamental to our success and I look forward to working with all my colleagues in further enhancing the market-leading services we provide to our clients. Email “KPMG gets new Managing Partner”. Feedback on “KPMG gets new Managing Partner”.